*Please note that a chess board is not included. Kings and Queens, Bishops and Rooks, all made with real silver! You don't need logic or skill to recognize the luxury and opulence of these stunning Sterling Silver Chess Pieces. This elegant set of silver chess pieces holds a total of 500 g (16 oz t) of sterling silver, and is exclusive to Kitco in North America. In addition another even rarer precious metal than silver, rhodium, is used as a coating to create the darker pieces for the black side of the board. This weighty and impressive set of silver chess pieces would make a fantastic graduation gift, a present for Dad on Father's day, an impressive retirement or anniversary gift for a valued colleague, or an incredibly valuable, interesting and educational gift for a teen or grandchild. Chess is a centuries old game. Chess pieces have evolved, both in shape and style over the centuries. Early chess pieces were often pieces of art, carved in marble, bone and ivory. Many modern chess pieces have lost this early attention to detail and style, and now are made of wood or plastic, or are simply digitally generated on an online chess app. With Kitco's handsome set of sterling silver chess pieces, we propose a return to a more elegant time, where the game of chess was played in style. Playing chess face to face requires patience and the luxury of time, and the beauty of these sterling silver chess pieces will only add to the experience. Many children enjoy chess, encouraged by their parents to build up the patience and logic required to master this ancient game. As a gift for older children or grandchildren, this silver chess set may be just the encouragement your child or grandchild needs to play the game of chess more frequently, to enjoy the social aspect of a chess game and to appreciate the artistic beauty of these sterling silver chess pieces. Make a gift of this set at the retirement of a business colleague, or as an exceptional birthday present for the person who has everything. This year's Father's Day present will be valued forever if you choose these Sterling Silver Chess Pieces as the perfect present for Dad. Made in Europe, you can be sure that everyone will appreciate the craftsmanship and beauty of these sterling silver chess pieces. The set of sterling silver chess pieces comes in a carrying case measuring 26.7 x 15.2 x 6.4 centimeters (10.5 x 6 x 2.5 inches). A unique way to hold precious metals! The Sterling Silver Chess Piece set is available only in very limited quantities, only from Kitco. Today, as a continuation of its commitment to the traditional trade of precious metals, Degussa offers a range of various precious metal bars manufactured to the highest standards by LBMA recognized refiners Argor-Heraeus SA and Valcambi SA through various retail outlets around the world. This exclusive Degussa Silver Chess Set is exclusively sold at Kitco. Why buy Silver Chess Pieces from Kitco? Kitco is a trusted leader in the silver bullion and physical precious metals industry. 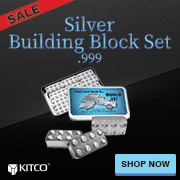 Silver and other precious metals sold by Kitco are recognized in bullion markets around the world. With our focus on silver bullion, you can benefit from our low silver bullion prices and premiums that are highly competitive in the bullion industry.